The show is called the Concours d'Elegance of the Eastern United States, but is commonly known as the Burn Prevention Concours, the Bethlehem Concours, and the Eastern Concours of the US. The event is held in Bethlehem, PA, which is a city in the Lehigh Valley region of eastern Pennsylvania. It is centrally located between Harrisburg (the capital of the Commonwealth of Pennsylvania) and Philadelphia (the largest city in PA and the sixth most populous city in the United States). It has been in existence for the past 19 years and its venue has changed several times since then; its home is now at the campus of the Northampton Community College. The money raised from this event helps support the Burn Prevention Foundation and the Foundation's 'Home Safe Home' initative. The theme highlighted styling, engineering, technology, and design innovation of the past century. The special celebration examined the evolution of the 'tailfin', which first appeared on the 1948 Cadillac. GM stylist Harley Earl is credited with beginning this aircraft-inspired styling craze, and was taken to the extremes by Virgil Exner, Dave Holls and other greats. The theme would continue for several years before losing interest with the public in the mid-1960s. The cars were organized into several categories; examining those categories quickly revealed a central theme - speed. There were categories for 'Sports,' 'Muscle,' 'Performance,' 'Competition,' and 'Contemporary Supercars.' These groups re-enforced the initial belief that high horsepower, displacement, and speed were welcome on the concours show field. The Muscle Car category included vehicles produced from 1964 through 1974, such as the legendary Pontiac GTO, Chevy Camaro and Chevelle SS, Dodge Charger, and the Ford Mustang Boss 302 and Mach I. The predecessors to the muscle car era were the performance cars produced from 1949 through 1963, which utilized America's first modern OHV V8 engine. Chrysler's 300 Series, Studebaker's Golden Hawk, the DeSoto Firedome, and the Dodge Custom Royal were examples showcased in this category. The sports category had both domestic and foreign cars that utilized lightweight construction and were built for speed and handling. The category that received much attention by spectators was the 'Contemporary Supercars.' This group included modern, powerful, expensive, rare, and exclusive machines where cost is no object. The list included a Bugatti Veyron, Audi R8, Mercedes-Benz McLaren SLR, Porsche Carrera GT, Rolls-Royce Phantom, and several other mouth-watering supercars. Adding to the day's enjoyment were several car clubs sitting in close proximity to the show field, yet separated by the main road leading into the event. This was a welcomed compliment to the show cars and offered onlookers an additional variety of vehicles to enjoy. The list included 911 Porsches, Corvettes, muscle cars, hot rods, and various other vehicles from all eras of life. There were a few potential and worthy candidates for the coveted 'Best of Show' award. As the sun continued to bake away the morning's dew, the show cars continued to gently roll onto the lawn. It was an eclectic array of vehicles, encompassing nearly 100 years of automobile production, and many different facets of design and accomplishments. The cars were guided into their groups by the volunteers and then quickly descended upon by spectators, photographers, and enthusiasts. It seems that 'Best of Show' for these types of events are typically chosen from the late 1920's through 1930's era. Using this theory, over half of the field was eliminated. A gorgeous LeBaron-bodied Isotta Fraschini stood out as a potential candidate. It won a class award at Pebble Beach and was 'Best of Show' at last year's Hilton Head Concours. It had one of the freshest and nicest restoration jobs on the field. A well-shown Delahaye Type 135, owned by Mr. Pray, has racked-up many awards during its show-career. For those who have never seen the car before, they are instantly smitten. Those who have, are equally captivated. Last year, Mr. Pray's Bugatti T-57C won 'Best of Show' at this event; he brought one of his finest cars from his collection to defend his title. Minerva's were produced in Belgium and were a favorite of royal families of many European countries and in the United States. They had elegance and an undeniable presence. The Knight double sleeve valve engine that provided the vehicles with their power, were silent, smooth, durable and dependable. The Minerva Town Car on display was among the most elegant at the show. The interior is well appointed and luxurious, and its size could humble a dump truck. What might have hurt the car's chances at 'Best of Show' honors, was its older restoration. Though it still shows very well, it had lost some of its luster and patina over time. The vehicle's other drawback was where it sat; it was positioned next to a Derham-bodied Duesenberg. Duesenberg's are among the elite for elegance, style, and performance. The 420 cubic-inch engine provided an astonishing 265 horsepower; a supercharger raised that figure even further. A Duesenberg won top honors at last years Pebble Beach Concours, and another example won at this year's Amelia Island Concours. They are a clear favorite wherever they travel. 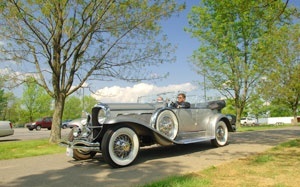 The 2008 Eastern Concours of the US had two Duesenberg's on display. The first was the Derham-bodied example, and the other was a Model J Skiff. It took many 'double takes' to finally be convinced it was an actual Duesenberg, and that the Lycoming straight-eight was under-hood. It is lower and shorter than any other Duesenberg constructed and almost appears to be a 'kit car.' It lacks the presence of the longer and taller examples, but still has the elegance and style. It began life as a town car with coachwork by Holbrook. In 1963, it was reconstructed by noted Duesenberg restorer Arthur Hol. The wood body was designed by the late-Herb Newport who also designed the two SSJ short-wheelbase roadster for Clark Gable and Gary Cooper as well as the Ethel Mars Town Car and the Mormon Meteor. John Todd, a Maryland boat and coachbuilder, constructed the wooden body using Honduras Mahogany. Though it was among the most exquisite on the field, its modern coachwork and compact size may have kept it from being a top contender. Some were qualified because of their elegance, others for their uniqueness, and others could be considered contenders for their performances at prior shows. The 1931 Packard FWD Prototype was among the most unique. It has a front-wheel drive configuration which was virtually unheard of for this era and powered by a V12 engine. Only one Packard FWD vehicle was ever produced, and this is the sole example at the companies attempt to revolutionize the way vehicles operated. The Packard Model 905 Twin Six also could have been considered a potential front-runner. As the day continued and the awards ceremony revealed the class winners, it was finally ready to announce the 'Peoples Choice' award. They elected the 1938 Delahaye as their favorite. Following the processional was the 'Best of Show', chosen to be the most outstanding automobile and having the best in elegance, styling, engineering, and restoration. Other criteria include authenticity, rarity and historical importance. The judges chose the Derham bodied Duesenberg Model J, a fitting honor to this prestigious rolling sculpture. Though the award was very appropriate, it was a slight surprise; last year's event had three equally impressive Duesenbergs, yet top honors went to the Bugatti T-57C Van Vooren- bodied Cabriolet. The 19th Annual Eastern Concours of the United States was blessed with great weather and a plethora of automotive art. There were many brilliant vehicles to admire and enjoy, and the enlistment of various car clubs greatly enhanced the show's allure. The theme, 100 Years of Automotive Innovation, told a story of the evolution of the automobile. Much has changed since the inception and it is interesting to think of another 100 years of automotive progress. The early years saw a struggle for dominance among the combustion engine, steam, and electric power. After the introduction of the electric starter, the internal combustion engine would become the favored powerplant. In modern times, auto-manufacturers are reconsidering this decision and seeking out ways to re-introduce electric and alternative fuel sources back into their model lineup. One stop along the past sixty years was the 'tailfin', which first appeared sixty years ago. The aircraft of World War II did much to inspire this design, and it was not long before this flamboyant style grew wings of its own. The years that followed centered on speed and performance. America's larger and accommodating roadways were traveled a quarter-mile at a time. Safety, among other reasons, brought this glorious part of history to an end. A rumor was floating around about next year's show - the 20th Anniversary Celebration. Perhaps winners from prior years may once again grace the lawn, all vying for the ultimate 'Best of the Best'. Even if this is just a rumor, we are sure something is in the works for the two decade celebration.